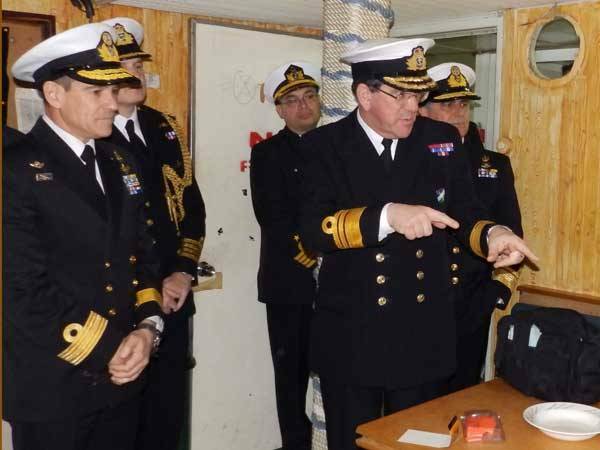 NATO Maritime Commander Vice Admiral Peter Hudson, CBE Royal Navy, visited the two-week Advanced Maritime Law Enforcement/Training of Trainers course taking place at NATO Maritime Interdiction Operational Training Centre (NMIOTC), in Souda Bay, Crete, Greece. The course is being conducted from February 23 to March 6 under the auspices of the Djibouti Code of Conduct (DCoC) and the Djibouti Regional Training Centre with the support and supervision of the IMO Secretariat’s Kiruja Micheni, and benefits from the high NATO standards embraced by NMIOTC. The course included training in evidence collection at a simulated crime scene on board a ship. In building on the success in combating piracy off the coast of Somalia through the combined efforts of international partners, IMO said its counter piracy program is repositioning itself toward developing sustainable measures to prevent reemergence of piracy and armed robbery against ships in the region. Toward this endeavor, 15 officers from Comoros, Kenya, Madagascar, Mauritius, Saudi Arabia, Seychelles and Tanzania are receiving training to prepare them to conduct courses on maritime law enforcement in their own countries. IMO collaboration with NMIOTC to deliver regional training started in 2012 and to date 200 officers from 18 DCoC signatory countries have received training at the center. The strength of IMO’s capacity building model for DCoC, will be replicated in West and Central Africa and arrangements are in place for NMIOTC to extend its training support to the Code of Conduct concerning the repression of piracy, armed robbery against ships and illicit maritime activity in west and central Africa.